I do love designer quality, but rarely (if ever) pay full price. This extends to buying plants. One of my favorite plants is called ‘Lavender Lace’. This plant is a beautiful, flowering trailing lantana that has two different colored flowers. I remember when I first saw this plant growing in a landscape. I had to stop my car and take a closer look. Since then, I have only rarely seen it in landscapes. But, I knew I wanted it when we re-landscaped our front garden. We did see it at our favorite nursery and I was so excited. Until I saw the $25 price tag…. Even though we had enough money to buy this ‘designer’ plant – I just couldn’t make myself purchase them. *The reason I wouldn’t buy them was because I knew that I could replicate the look of the ‘Lavender Lace’ Lantana for a fraction of the cost. My ‘knock-off’ looks pretty good, doesn’t it? It was absurdly easy to do. 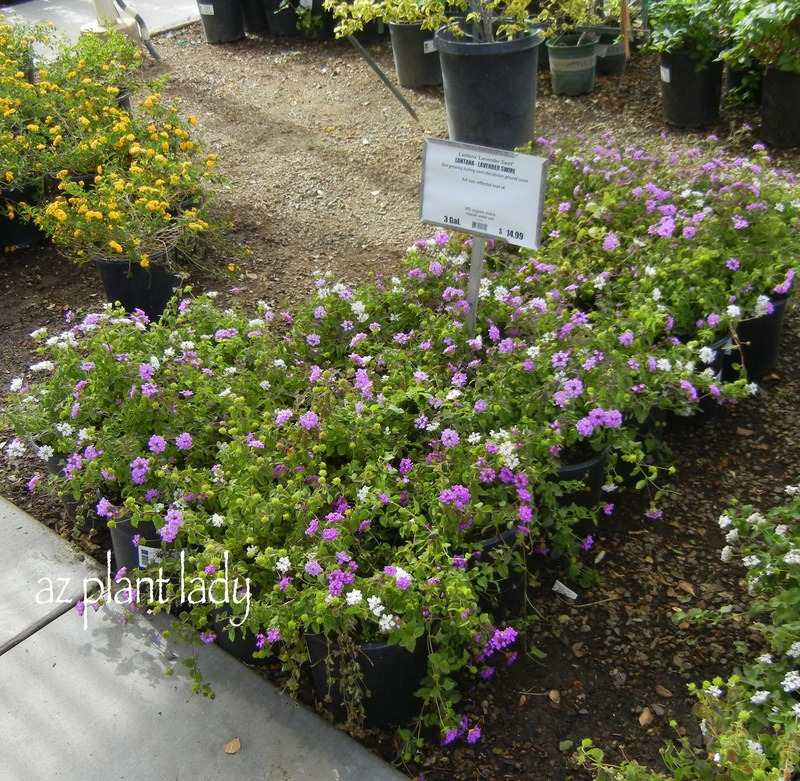 Simply take a 1-gallon Purple Trailing Lantana AND a 1-gallon White Trailing Lantana and plant them next to each other in the same hole. That’s it. As they grow, the purple and white flowers will intermingle with each other. I love the effect of these two colors together. AND, what I love even better is that I was able to achieve the same effect as ‘Lavender Lace’ Lantana for $4 instead of the $25 dollar ‘designer’ price tag. Your bargain looks wonderful. You did a great job mixing the two together. This is a good technique – I've done that in a pinch to make a larger tree out of something spindly. That cost for a 1 gallon lantana is higher than we pay over in NM for our "designer plants"! I want to have these in my garden. Did you add amendments in the hole or are these plants usually fine without? Lantanas are quite tolerant of different types of soil. No special amendments are needed. I do recommend that you dig the hole twice as wide as the rootball, which will help the roots become established more quickly.